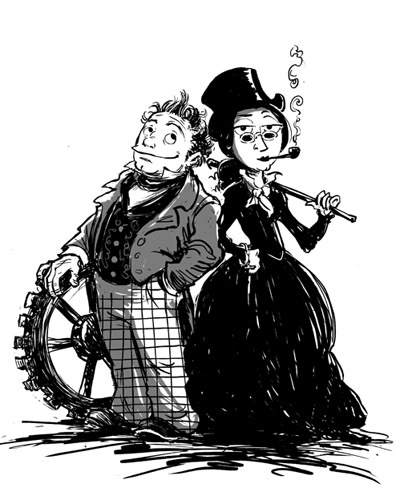 My copy of Sydney Padua’s The Thrilling Adventures of Lovelace & Babbage is supposed to arrive next week (21 April 2015). I’m a little excited. As regular patrons of The Finch & Pea know, I’m just a little bit of a fan of her work*. Until then (or until the copy you just ordered arrives), you contemplate the complexity and beauty of the completed analytical engine (if only in Padua’s imagination) at The Guardian. You can also read about the development of the illustration and the choice of color palette at Padua’s own site. 1. About The Thrilling Adventures of Lovelace & Babbage book. 3. How to study, and how not to study. 4. Eyes on the solar system by JPL. Am I unreasonably excited that my favorite webcomic, The Thrilling Adventures of Lovelace and Babbage, is going to be published as a book? No. For those of you familiar with the funny, hyper-referential, quirky work of Sydney Padua, my excitement would be considered entirely reasonable in its grandiosity. Now it my great pleasure to announce that this humble comic has been elevated to the PANTHEON one might say, actually, one would definitely say, because Pantheon Bookshas heard your pleas (a lot more effectively than I have it seems) and we are going to do Lovelace and Babbage: The Papery Thing with Ink On! If you were wondering what to get me for my birthday next year. . .